This sweet and tangy orange maple salmon recipe takes less than 30 minutes to make and has only five ingredients. Plus it’s a hit with the kids! All around a perfect weeknight meal for the family! 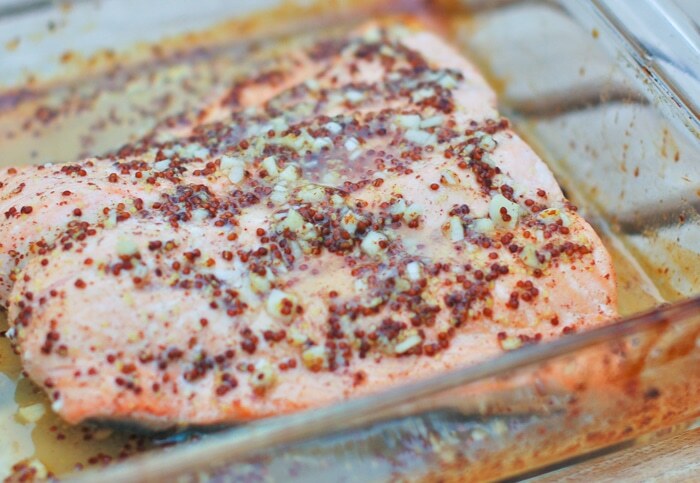 This orange maple salmon recipe is awesome. I’m just going to put it out there. It has 5 ingredients, takes less than 30 minutes to make, and is a hit with kids and adults alike. Plus, if you’re on a gluten-free, egg-free, nut-free, or dairy-free diet, it’s a winner all around for you! I can’t wait for you to try it out on your family, but before you do, let’s discuss syrup. Maple syrup that is. I honestly don’t even remember how this Orange Maple Salmon recipe came about, but it was such a delicious combination that brought my husband to rave about fish (especially impressive since it’s taken quite some time to get him to enjoy salmon) and get the two thumbs up I needed to add it to the go-to fish recipe pile. It is truly what I would consider a quick and easy recipe (by the way, you have to read this post by my friend Rachael about “easy” recipes). All you need are five ingredients for this Orange Maple Salmon: salmon, orange juice, maple syrup, mustard, and garlic. The only prep involved is squeezing oranges and mincing garlic, but if you want to save even more time you can use bottled orange juice and pre-grated garlic, like this from Dorot or Gourmet Garden. Once you mix together the ingredients (besides the salmon), pour the marinade over the fish and cook. If you have the time to prep ahead you can also cover the fish and marinate it in the fridge, just be sure you cook it within a few hours. Serve it with your favorite side of vegetables and whole grains and you have the perfect weeknight dinner. 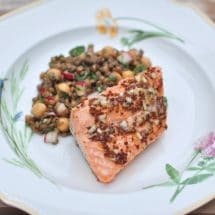 The first time I made this Orange Maple Salmon I served it with Cookie + Kate’s Lemony Lentil and Chickpea Salad with Radish and Herbs (pictured with the salmon above), and on other occasions I’ve served it with Garlicky Green Beans, roasted cauliflower, and/or Maple-Roasted Delicata Squash Quinoa Salad. It would also go great with my Cranberry Ginger Sorghum Salad, especially this time of year. However you choose to serve it, trust me you’ll enjoy it – especially the fact that it was so easy to make! Sweet and tangy orange maple salmon takes less than 30 minutes to make and has only five ingredients. The perfect weeknight meal for the whole family! Preheat oven to 375 degrees F. Spray appropriately sized baking dish with cooking spray and lay salmon fillet in dish, skin side down. In a small mixing bowl, whisk together orange juice, maple syrup, mustard, and garlic. Pour sauce over fish and cover with foil. Bake for 15 minutes. Uncover, and bake another 5 minutes until top of fish is caramelized and fish is cooked through. What’s your favorite way to use maple syrup in the kitchen? This looks amazing! I love salmon and have all those ingredients on hand, so this recipe really is going to be easy! Thanks Melanie! Can’t wait to hear what you think about it! Yum, the combination of orange with maple sounds so delicious! Thanks Steph! It’s really good – has a nice tangy and sweet flavor! Salmon is always in rotation at our house. We will have to add this recipe! Thanks Sandra. Hope you like it! Thanks so much Janice! Hope you love it! I bet the mustard and orange together is a great combo! I have both right now so I think I need to pick up some salmon and try it this week! Oh it is, Sarah! I sure do hope you try it!! 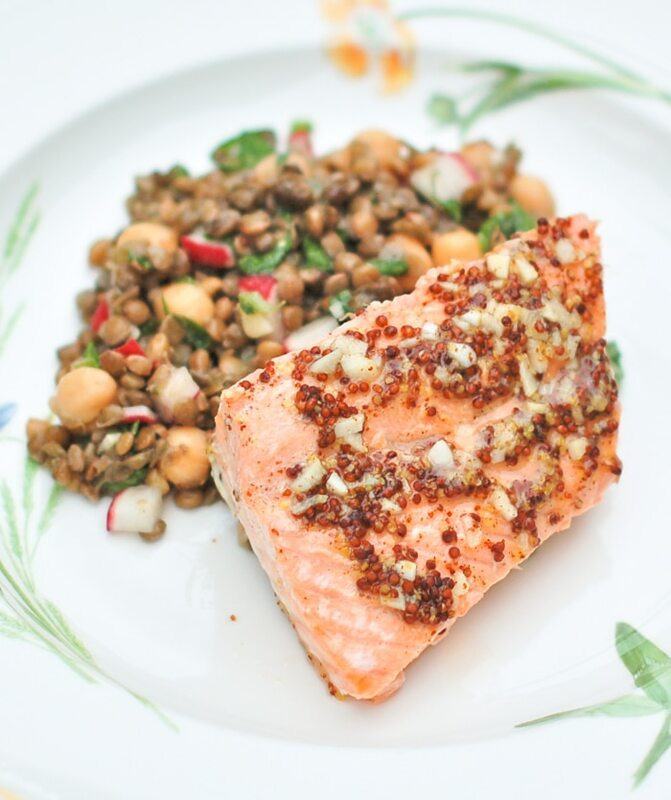 Loving that tangy sweetness in your orange maple salmon! Gotta keep good ole maple syrup on hand. Thanks Lauren – it is so yummy, making it again this week! And yes, I ran out of maple syrup last week and stood in my pantry in shock I was out of a backup!! Thanks Nicole! Hope you give it a try – it’s so easy! !